NE SUMMER'S MORNING a little tailor was sitting on his table by the window; he was in good spirits, and sewed with all his might. Then came a peasant woman down the street crying: 'Good jams, cheap! Good jams, cheap!' This rang pleasantly in the tailor's ears; he stretched his delicate head out of the window, and called: 'Come up here, dear woman; here you will get rid of your goods.' The woman came up the three steps to the tailor with her heavy basket, and he made her unpack all the pots for him. He inspected each one, lifted it up, put his nose to it, and at length said: 'The jam seems to me to be good, so weigh me out four ounces, dear woman, and if it is a quarter of a pound that is of no consequence.' The woman who had hoped to find a good sale, gave him what he desired, but went away quite angry and grumbling. 'Now, this jam shall be blessed by God,' cried the little tailor, 'and give me health and strength'; so he brought the bread out of the cupboard, cut himself a piece right across the loaf and spread the jam over it. 'This won't taste bitter,' said he, 'but I will just finish the jacket before I take a bite.' He laid the bread near him, sewed on, and in his joy, made bigger and bigger stitches. In the meantime the smell of the sweet jam rose to where the flies were sitting in great numbers, and they were attracted and descended on it in hosts. 'Hi! who invited you?' said the little tailor, and drove the unbidden guests away. The flies, however, who understood no German, would not be turned away, but came back again in ever-increasing companies. The little tailor at last lost all patience, and drew a piece of cloth from the hole under his work-table, and saying: 'Wait, and I will give it to you,' struck it mercilessly on them. When he drew it away and counted, there lay before him no fewer than seven, dead and with legs stretched out. 'Are you a fellow of that sort?' said he, and could not help admiring his own bravery. 'The whole town shall know of this!' And the little tailor hastened to cut himself a girdle, stitched it, and embroidered on it in large letters: 'Seven at one stroke!' 'What, the town!' he continued, 'the whole world shall hear of it!' and his heart wagged with joy like a lamb's tail. The tailor put on the girdle, and resolved to go forth into the world, because he thought his workshop was too small for his valour. Before he went away, he sought about in the house to see if there was anything which he could take with him; however, he found nothing but an old cheese, and that he put in his pocket. In front of the door he observed a bird which had caught itself in the thicket. It had to go into his pocket with the cheese. Now he took to the road boldly, and as he was light and nimble, he felt no fatigue. 'Oh, indeed?' answered the little tailor, and unbuttoned his coat, and showed the giant the girdle, 'there may you read what kind of a man I am!' The giant read: 'Seven at one stroke,' and thought that they had been men whom the tailor had killed, and began to feel a little respect for the tiny fellow. Nevertheless, he wished to try him first, and took a stone in his hand and squeezed it together so that water dropped out of it. 'Do that likewise,' said the giant, 'if you have strength.' 'Is that all?' said the tailor, 'that is child's play with us!' and put his hand into his pocket, brought out the soft cheese, and pressed it until the liquid ran out of it. 'Faith,' said he, 'that was a little better, wasn't it?' The giant did not know what to say, and could not believe it of the little man. 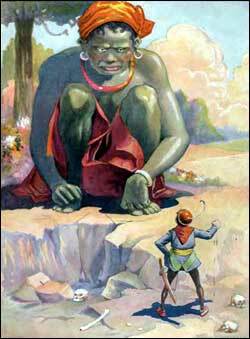 Then the giant picked up a stone and threw it so high that the eye could scarcely follow it. 'Now, little mite of a man, do that likewise,' 'Well thrown,' said the tailor, 'but after all the stone came down to earth again; I will throw you one which shall never come back at all,' and he put his hand into his pocket, took out the bird, and threw it into the air. The bird, delighted with its liberty, rose, flew away and did not come back. 'How does that shot please you, comrade?' asked the tailor. 'You can certainly throw,' said the giant, 'but now we will see if you are able to carry anything properly.' He took the little tailor to a mighty oak tree which lay there felled on the ground, and said: 'If you are strong enough, help me to carry the tree out of the forest.' 'Readily,' answered the little man; 'take you the trunk on your shoulders, and I will raise up the branches and twigs; after all, they are the heaviest.' The giant took the trunk on his shoulder, but the tailor seated himself on a branch, and the giant, who could not look round, had to carry away the whole tree, and the little tailor into the bargain: he behind, was quite merry and happy, and whistled the song: 'Three tailors rode forth from the gate,' as if carrying the tree were child's play. But the little tailor was much too weak to hold the tree, and when the giant let it go, it sprang back again, and the tailor was tossed into the air with it. When he had fallen down again without injury, the giant said: 'What is this? Have you not strength enough to hold the weak twig?' 'There is no lack of strength,' answered the little tailor. 'Do you think that could be anything to a man who has struck down seven at one blow? I leapt over the tree because the huntsmen are shooting down there in the thicket. Jump as I did, if you can do it.' The giant made the attempt but he could not get over the tree, and remained hanging in the branches, so that in this also the tailor kept the upper hand. The giant said: 'If you are such a valiant fellow, come with me into our cavern and spend the night with us.' The little tailor was willing, and followed him. When they went into the cave, other giants were sitting there by the fire, and each of them had a roasted sheep in his hand and was eating it. The little tailor looked round and thought: 'It is much more spacious here than in my workshop.' The giant showed him a bed, and said he was to lie down in it and sleep. The bed, however, was too big for the little tailor; he did not lie down in it, but crept into a corner. The little tailor went onwards, always following his own pointed nose. After he had walked for a long time, he came to the courtyard of a royal palace, and as he felt weary, he lay down on the grass and fell asleep. Whilst he lay there, the people came and inspected him on all sides, and read on his girdle: 'Seven at one stroke.' 'Ah!' said they, 'what does the great warrior want here in the midst of peace? He must be a mighty lord.' They went and announced him to the king, and gave it as their opinion that if war should break out, this would be a weighty and useful man who ought on no account to be allowed to depart.